Do you see yourself as a witty and creative individual? Do others describe you as wise and intelligent? Do teachers praise your amazing ability to learn and be original? Well, then it sounds like you're a perfect candidate to join the Ravenclaw House when you finally get that acceptance letter from Hogwarts! Now you'll just want to make sure you have the proper attire for a school year at Hogwarts, so why not start with this Ravenclaw Knitted Beanie? It will be perfect for walks to class through the cold winter months or even just to hide a bad hair day from those Slytherin meanies. When that letter does show up at your doorstep you'll be one step closer to mastering the arts of witchcraft and wizardry under the guidance of magical masters, like Filius Flitwick, that keep the house up to strict standards of the great Rowena Ravenclaw. You will have to make sure you stay on top of your studies! In Ravenclaw, academics are placed above all else. So you can expect intense competition both inside and outside the halls of Ravenclaw! 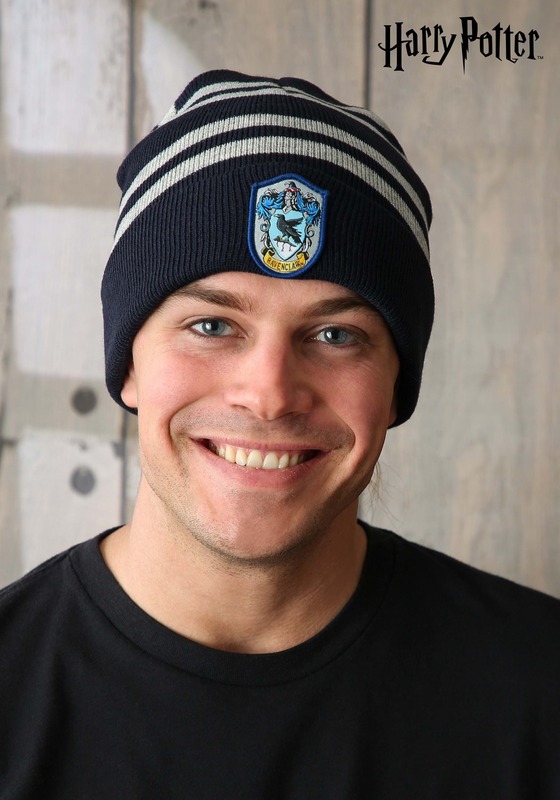 Proudly support your favorite house in Hogwarts when you throw on this Ravenclaw Hat! This is a really nice stocking cap that can be used all year round, not a cheap halloween accessory. It has a nicely detailed Ravenclaw emblem patch on the front as well.